It’s been my experience that if you walk into any Asian household, they almost always have cooked rice on hand. Either freshly cooked or yesterday’s leftovers in the fridge. 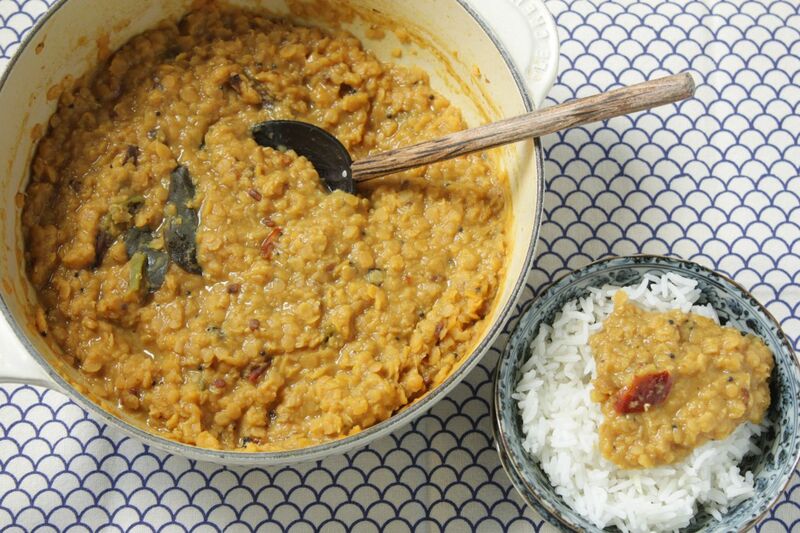 Growing up, our household almost always had rice and dhal on hand. Together they constitute a meal, a complete protein and something totally satisfying. It’s more delicious and comforting than you might imagine, this simple lentil rice bowl. But dhal is also eaten alongside a dozen other curries. Some cultures eat it strictly with naan (something very similar to Sri Lankan roti) and some serve it as a soup, much looser than the version I’m used to eating. You can use any split lentil but the red lentils (clearly orange despite their name) are traditional and also my favourite. Excellent. Had to make a few small alterations. Turned out great. so glad you tried it and that it worked with your changes, rob. thanks for letting me know! I need to try your dal! I’m still very much a beginner with Sri Lankan food.